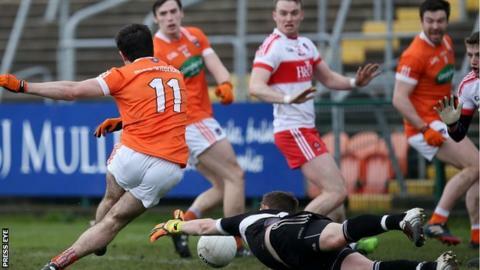 Armagh have been relegated to Division Three of the Football League despite beating Derry at the Athletic Grounds. Kieran McGeeney's men would have stayed up if Tyrone had beaten Fermanagh or Laois had defeated Meath. But both games went against the Orchard County on an exciting final day of fixtures. Fermanagh drew with Tyrone and Meath secured victory which meant a three-way tie on six points and Armagh ended up going down on points difference. Laois were the other county making the drop to Division Three. Cavan, who beat Galway at Breffni Park, go up to Division One along with the already-promoted and undefeated Tyrone. It was a bitterly disappointing afternoon for Armagh. If Meath had fallen to Laois, McGeeney's men would have stayed up through their head-to-head with Fermanagh. But the three-way tie sealed their fate and the six-point victory over Derry counted for nothing. A Micael McKenna goal just before half-time gave Armagh a 1-12 to 0-7 interval advantage, but Derry fought back through James Kielt, Ryan Bell and three Mark Lynch frees. However Armagh, boosted by a string of Ethan Rafferty frees, pulled away to wrap up the victory. Fermanagh fans endured a tense final few minutes in Enniskillen as their match with Tyrone hung in the balance. Pete McGrath's men had been a point down at the interval after Barry Tierney had netted the only goal for the Red Hands. Tomas Corrigan's black card did not help matters, but soon after that a similar fate befell Tyrone lost skipper Sean Cavanagh. Fermanagh sub Pat Cadden floated over a point to edge the hosts ahead and Ronan O'Neill levelled with a free. There were still several minutes to play but there were no more scores and McGrath's men survived on points difference.